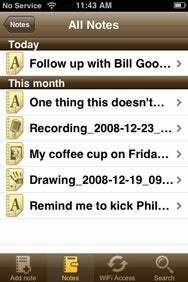 Notable Appearance: Readdle’s Take A Note uses a brown and light yellow color scheme that creates an aesthetically pleasing app for the iPhone or iPod touch. Now, it isn’t exactly fair to hold every third-party app developer to a lofty Cupertino standard. But it may be fairer to say that a healthy majority of apps for the iPhone and iPod Touch deliver on form or function, but rarely deliver both. Oh, sure, there are quite a few apps that are as stylistic as they are functional. Instapaper ( ) and Classics ( ) spring instantly to mind. Many developers, however, have the programming skills but lack the design savvy to effectively meld style with substance. That thought occurred to me again as I was using Readdle’s Take A Note app. I had already reviewed and adopted YouNote ( ), which is an excellent, free note-taking organizational tool for the iPhone and iPod Touch. YouNote is functional, but not at all beautiful. Take A Note is drop-dead gorgeous. But is it also functional? The answer is an emphatic yes. Although Take A Note lacks some of the features that makes YouNote a powerful tool, the app makes up for it with a brilliant design, a clean interface, excellent audio functionality and easy Wi-Fi backup. Developer Igor Zhadanov obviously has a keen aesthetic eye. When you launch Take A Note, the title screen is a weathered, brown leather spiral notebook cover. The tasteful brown and light yellow color scheme evokes an old drawing room or a private detective’s office. All that’s missing, alas, is the smell of the leather and cigar smoke, and the silky smooth texture of the pages. 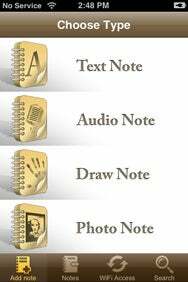 Take A Note organizes your notes by text, audio, drawing or photo. The app also lets you set up your own categories, such as “home” or “work” or any esoteric label you wish. Although I miss YouNote’s color-coding scheme, Take A Note’s simple checklist-style categorization is a nice feature for keeping notes orderly. You can also add text comments to audio, photo or drawing notes. YouNote’s tagging function is superior, however. Take A Note will let you apply only one category to each note. But the app automatically sorts notes by category, which simplifies browsing somewhat. Note The Date: Take A Note organizes your notes in broad chronological order, but it doesn’t apply date and time stamps to text-based notes. You can back up your notes easily to any Mac or PC through a Wi-Fi connection. Simply create a new network connection on your desktop or laptop machine, tap the app’s Wi-Fi button, enter the username (it’s always “notes”) and password (newly generated with each use), and voila! Take A Note’s files pop open as easy-to-read text files. Perhaps best of all, this function works both ways—if you tap out notes on your laptop or desktop machine, copying them into Take A Note is a simple matter of dragging and dropping a text file into a networked folder. In this key respect, Take A Note has a decisive edge over YouNote’s cumbersome back-up process, which requires a hard-wired connection from device to computer. And Take A Note also lets you e-mail your notes within the app, a feature that YouNote sorely lacks. Drawbacks? Take A Note has a few. It doesn’t have landscape support, for instance. Inexplicably, the app doesn’t apply date and time stamps to text-based notes, but includes dates and times by default in audio and picture notes. The app will break down your notes in broad chronological order—that is, “today,” “this month,” “last month”—but if you want to know when you made a particular note, you had best tap in the date and time yourself. Similarly, the app’s search feature only lets you search by name. Unlike YouNote, Take A Note does not let you grab and tag Web pages. Although I don’t use that feature in YouNote very often, it’s nice to have when I need it. I maintain that, as an organizer, YouNote is still tops. And the price is certainly right. But Take A Note’s ease of use and a gorgeous interface makes it a truly worthy rival, and one that I suspect I’ll be using a lot more with future updates. Take a Note is compatible with any iPhone or iPod touch running the iPhone 2.1 software update.